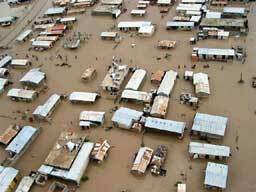 HAITI : FLOOD EFFECTS after the TROPICAL STORM "JEANNE"
Request received from OXFAM QUEBEC, September 24, 2004. Emergency mode engaged under mandate of the Canadian Space Agency on September 27, 2004. RADARSAT-1 radar imagery successfully acquired over Haïti by the Canadian Space Agency and Radarsat International on September 24, and September 30, 2004. 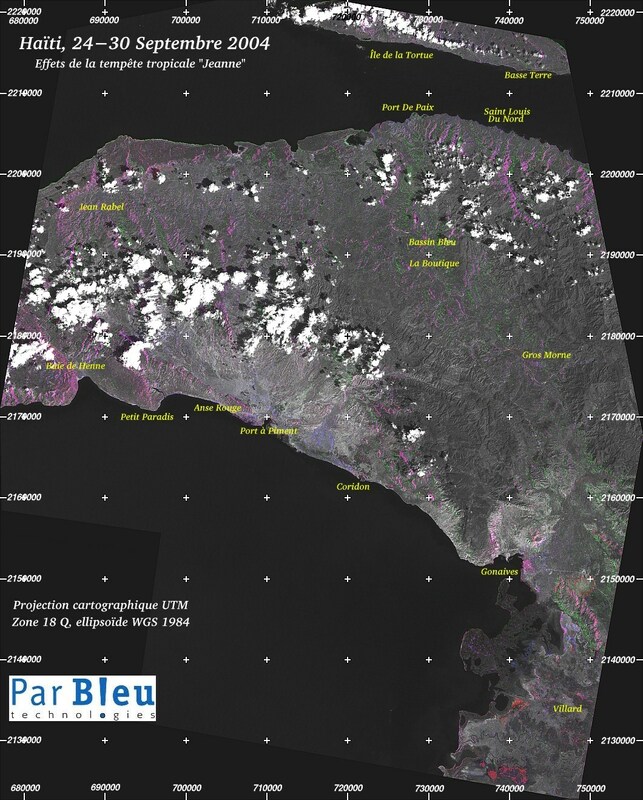 RADARSAT-1 radar images received by PARBLEU Technologies Inc. on September 29 and October 05, 2004. Processing of the RADARSAT-1 radar imagery engaged, and production of damage assessment maps in production at PARBLEU Technologies Inc.
First high resolution damage assessment maps made available on-line on October 05, 2004. Operation completed: October 18, 2004. Letter of Appreciation received from OXFAM Québec on November 17, 2004. The area that has been surveyed extends over 100 x 80 kilometers, in the départements of "Nord-Est" and "Artibonite". All speckle filtered images and damage assessment maps (processing by ParBleu Technologies Inc.) are produced in cartographic projection UTM WGS 1984 (Zone 18 Q), and at a spatial resolution of 15 meters x 15 meters (in some case, at 12.5 meters x 12.5 meters). On the global map below, crosses are spaced every 10 kilometers, at UTM coordinates that are a multiple of 10000. On all other maps, crosses are spaced every 5 kilometers, at UTM coordinates that are a multiple of 5000. The map below is a medium resolution damage assessment map (spatial resolution of 75 meters x 75 meters) of the overall area monitored by the Canadian RADARSAT-1 satellite. For an easier legibility, the effects detected using multi-temporal RADARSAT-1 radar imagery have been superimposed on top of a LANDSAT-7 Panchromatic image of July 3rd, 2003. Wherever the option is available, click on your area of interest to acquire a detailed close-up view at a spatial resolution of 15 meters x 15 meters.